So today at the gym it was actually significantly less crowded than the day before. However I did still get to see something pretty unique on the Cybex cross trainer machine. 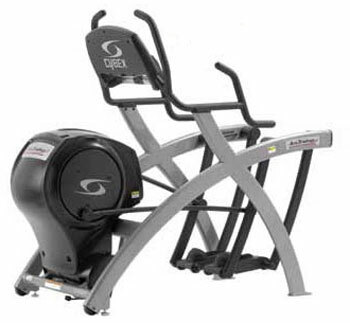 The machine is designed for you to swing your legs back and forth in an arcing motion against different levels of resistance and varying amounts of arc. From across the gym I saw a middle aged man I didn’t recognize on the machine looking like he was hopping on it for periods of time, with his shoulders arched/rounded forward at the top of the motion. He only did this for part of the time, the rest he was moving normally. I had to get a closer look at what he was exactly doing so I threw a paper towel away in the trashcan by his machine. Basically it seemed like he was periodically only doing half swings with the arc set at a very high level, repeatedly bouncing up and down on the same side instead of alternating legs. I was not sure what the reason or benefit was for this periodic, spastic movement on the machine, all I know was it was fun to watch. I have been trying to increase my intensity at the gym. Some further investigation of my issues down below have lead me to some alternative methods of dealing with it that thus far seem to be helping. As a result I wasn’t scared to do some reps at 220 pounds on the Total Squat machine. If I had more time I would have considered even dead lifting a few reps.